PHOTO PROVIDED Vadym Kholodenko gave a brilliant and pleasingly unexpected interpretation of Ravel's Piano Concerto in G Major with the RPO on Thursday. This was an RPO debut for the New Zealand-born conductor Gemma New, and the audience definitely liked her. More importantly, so did the orchestra, which gave its all for her in a program offering plenty of opportunity for virtuosity. The concert opened with a laid-back kind of virtuosity: the lovely languor of Debussy's "Prelude to the Afternoon of a Faun." It opens quietly, with the most famous flute solo in the repertory, which was lusciously performed by Principal Flute Rebecca Gilbert. New's conducting style is extremely active and detailed, with lots of stretching and moving around on the podium. It was a bit distracting to watch in a quiet, seductive piece like this one. On the other hand, the conductor got great results, achieving a blend of clarity and sensuality Debussy would surely have appreciated. 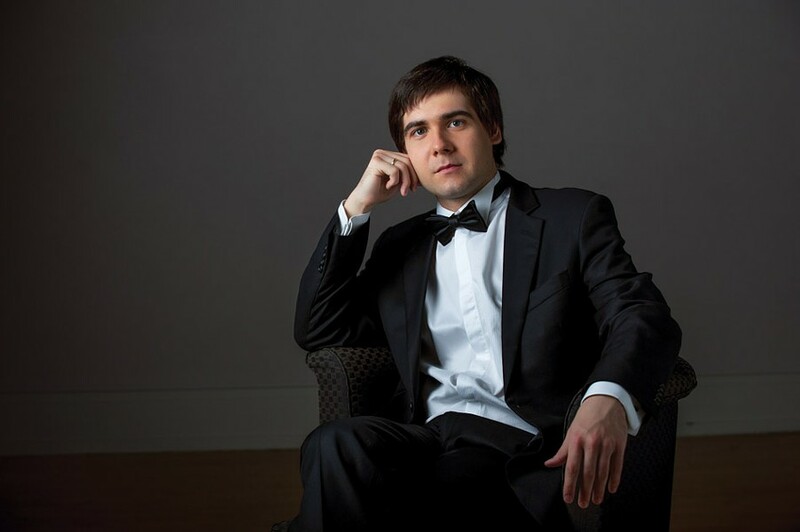 Pianist Vadym Kholodenko is already an RPO favorite. He's appeared here twice before, both times performing Prokofiev concertos, and very impressively. His serious demeanor and rather diffident stage presence are rather appealing, but he also has the powerful, slightly steely sound and fearsomely accurate fingers we associate with Russian pianists. Those traits have proved to be ideal for Prokofiev, but after his last appearance, I remember wondering how it would serve other composers. In the case of the Ravel G-Major Concerto, which he's playing this week, he gave a brilliant and pleasingly unexpected interpretation. I say "unexpected" because this piece is generally interpreted as a light, glittering showpiece. Kholodenko certainly provided the glitter. He played all those runs, trills and broken chords absolutely accurately - and apparently without producing a drop of sweat - and gave some interesting nudges to Ravel's syncopated rhythms. Ravel wrote this concerto in 1932, and it is shot through with the influence of le jazz hot. But by taking some slower-than-usual tempos in spots, he brought an unexpected touch of soulfulness to the music - a shot of vodka in the soufflé. Kholodenko's firm approach also paid off in the concerto's slow movement, a time-stands-still moment - much of it is a single line of melody in the piano, which the pianist inflected carefully and lovingly with a gentle accompaniment in the orchestra. This approach was a bit unconventional, but arresting, especially with Gemma New and the orchestra members shooting off fireworks in all directions in Kholodenko's support. The ensemble truly made the most of Ravel's zany, almost Looney Tunes-esque scoring in the raucous outer movements - complete with whips, squealing clarinets, smeary trombones. After his ovation, Kholodenko offered a substantial encore, and more Ravel. "Alborada del Gracioso" is perhaps best known in Ravel's orchestrated version, but the original is brilliant - a toccata with a pronounced Spanish flavor. Kholodenko did not overdo the Spanish flourishes, but emphasized biting clarity of rhythm and precise chords. As in the concerto, there are a lot of notes to play, and just about every note told. Vadym Kholodenko already makes me wonder what he'll play for his next RPO appearance. Rimsky-Korsakov's "Scheherazade" is a "concert favorite" that, for some reason, I had never actually heard in a concert until last night. It's definitely a recorded favorite; there are 114 versions of it out there. Nobody ever calls it a great work, but Rimsky's multicolored approach to orchestration was very influential on the generation of composers after him: I doubt that either Debussy or Ravel would have sounded quite the way they do if Rimsky-Korsakov hadn't arrived first. And this musical impression of the "thousand and one nights" is still a lot of fun, if the conductor and musicians have fun playing it. That was definitely the case here. In fact, I can't really imagine a better performance of "Scheherazade." Gemma New kept a firm hand on the discursive structure of the four long movements, giving the piece a real storytelling quality. The RPO sounded just plain brilliant. A couple of the climaxes were overwhelming - not easy to achieve in Kodak Hall - and the more delicate sections of the music were full of delicious details. The third movement, "The Young Prince and the Young Princess," was an absolute gem. On the last chord I heard someone near me whisper "Ah!" Though "Scheherazade" is scored for a very large orchestra, it is best known for its many, many instrumental solos. Practically every first-desk player, from concertmaster to trombone, has at least a few chances to shine as the tale is told. Listing all the players would take up a couple of paragraphs in itself; suffice it to say that each of them got a solo bow and each of them richly deserved it. Color and warmth are not in the forecast for the weekend, but what the weather can't supply, the RPO, New, and Kholodenko will.